What are the different service group types ? 1. Failover – Service group runs on one system at a time. 2. Parallel – Service group runs on multiple systems simultaneously. 3. 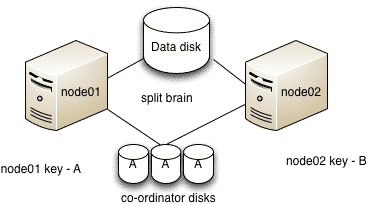 Hybrid – Used in replicated data clusters (disaster recovery setups). SG behaves as Failover within the local cluster and Parallel for the remote cluster. Where is the VCS main configuration file located ? The main.cf file contains the configuration of the entire cluster and is located in the directory /etc/VRTSvcs/conf/config. How to set VCS configuration file (main.cf) ro/rw ? Where is the VCS engine log file located ? What are the different resource types ? 1. Persistent : VCS can only monitor these resources but can not offline or online them. 2. On-Off : VCS can start and stop On-Off resource type. Most resources fall in this category. 3. On-Only : VCS starts On-Only resources but does not stop them. An example would be NFS daemon. VCS can start the NFS daemon if required, but can not take it offline if the associated service group is take offline. 6. start VCS on other nodes in the cluster. What is GAB, LLT and HAD and whats their functionalities ? GAB, LLT and HAD forms the basic building blocks of vcs functionality. LLT (low latency transport protocol) – LLT transmits the heartbeats over the interconnects. It is also used to distribute the inter system communication traffic equally among all the interconnects. GAB (Group membership services and atomic broadcast) – The group membership service part of GAB maintains the overall cluster membership information by tracking the heartbeats sent over LLT interconnects. The atomic broadcast of cluster membership ensures that every node in the cluster has same information about every resource and service group in the cluster. HAD (High Availability daemon) – the main VCS engine which manages the agents and service group. It is in turn monitored by a daemon named hashadow. What are the various GAB ports and their functionalities ? Whats the maximum number of LLT links (including high and low priority) can a cluster have ? A cluster can have a maximum of 8 LLT links including high and low priority LLT links. How to check the detailed status of LLT links ? What are the various LLT configuration files and their function ? LLT uses /etc/llttab to set the configuration of the LLT interconnects. Here, set-cluster -> unique cluster number assigned to the entire cluster [ can have a value ranging between 0 to (64k – 1) ]. It should be unique across the organization. set-node -> a unique number assigned to each node in the cluster. Here the name node01 has a corresponding unique node number in the file /etc/llthosts. It can range from 0 to 31. LLT has an another optional configuration file : /etc/VRTSvcs/conf/sysname. It contains short names for VCS to refer. It can be used by VCS to remove the dependency on OS hostnames. What are various GAB configuration files and their function ? The file /etc/gabtab contains the command to start the GAB. here -n 4 –> number of nodes that must be communicating in order to start VCS. What’s a GAB seeding and why manual GAB seeding is required ? The GAB configuration file /etc/gabtab defines the minimum number of nodes that must be communicating for the cluster to start. This is called as GAB seeding. In case we don’t have sufficient number of nodes to start VCS [ may be due to a maintenance activity ], but have to do it anyways, then we have do what is called as manual seeding by firing below command on each of the nodes. How to start HAD or VCS ? To start HAD or VCS on all nodes in the cluster, the hastart command need to be run on all nodes individually. What are the various ways to stop HAD or VCS cluster ? The command hastop gives various ways to stop the cluster. How to enable/disable a resource ? How to add a service group(a general method) ? How to check the configuration of a service group – SG ? How to bring service group online/offline ? The -any option when used instead of the node name, brings the SG online/offline based on SG’s failover policy. How to switch service groups ? How to freeze/unfreeze a service group and what happens when you do so ? When you freeze a service group, VCS continues to monitor the service group, but does not allow it or the resources under it to be taken offline or brought online. Failover is also disable even when a resource faults. When you unfreeze the SG, it start behaving in the normal way. When a node in the cluster has only the last LLT link intact, the node forms a regular membership with other nodes with which it has more than one LLT link active and a Jeopardy membership with the node with which it has only one LLT link active. 3. Service groups SG01, SG02, SG03 continue to run and other cluster functions remain unaffected. 4. If node03 faults or last link breaks, SG03 is not started on node01 or node02. This is done to avoid data corruption, as in case the last link is broken the nodes node02 and node01 may think that node03 is down and try to start SG03 on them. This may lead to data corruption as same service group may be online on 2 systems. 5. Failover due to resource fault or operator request would still work. How to recover from a jeopardy membership ? To recover from jeopardy, just fix the failed link(s) and GAB automatically detects the new link(s) and the jeopardy membership is removed from node. Whats a split brain condition ? Split brain occurs when all the LLT links fails simultaneously. Here systems in the cluster fail to identify whether it is a system failure or an interconnect failure. Each mini-cluster thus formed thinks that it is the only cluster thats active at the moment and tries to start the service groups on the other mini-cluster which he think is down. Similar thing happens to the other mini-cluster and this may lead to a simultaneous access to the storage and can cause data corruption. What is I/O fencing and how it prevents split brain ? VCS implements I/O fencing mechanism to avoid a possible split-brain condition. It ensure data integrity and data protection. I/O fencing driver uses SCSI-3 PGR (persistent group reservations) to fence off the data in case of a possible split brain scenario. As show in the figure above assume that node01 has key “A” and node02 has key “B”. 1. Both nodes think that the other node has failed and start racing to write their keys to the coordinator disks. Whats the difference between MultiNICA and MultiNICB resource types ? – Requires only 1 base IP (test IP). – Does not require to have all IPs in the same subnet. – Faster failover than the MultiNICA. – Requires IP address for each interface. How to flush a service group and when its required ? Flushing of a service group is required when, agents for the resources in the service group seems suspended waiting for resources to be taken online/offline. Flushing a service group clears any internal wait states and stops VCS from attempting to bring resources online. How to clear resource faults ? To clear a resource fault, we first have to fix the underlying problem. Do not do anything and wait for the next OfflineMonitorInterval (default – 300 seconds) for the resource to become online. How to clear resources with ADMIN_WAIT state ? If the ManageFaults attribute of a service group is set to NONE, VCS does not take any automatic action when it detects a resource fault. VCS places the resource into the ADMIN_WAIT state and waits for administrative intervention. Hope this post was informative. Do comment below if you have some more questions to add to this list.